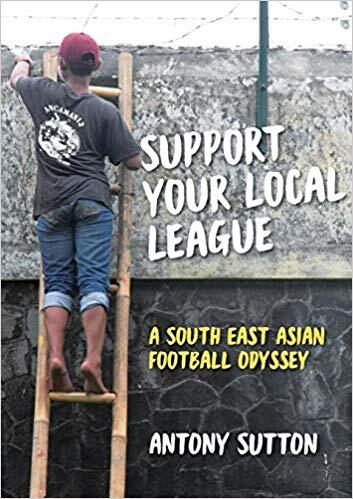 I am delighted to say my second book, Support Your Local League - A South East Asian Football Odyssey is now available in both old school print and new fangled ebook. 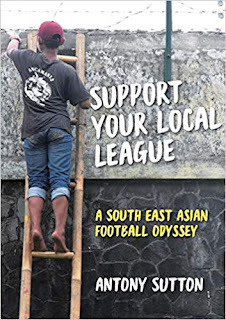 The book looks at football in four South East Asian countries, Indonesia, Malaysia, Singapore and Thailand and draws heavily on my experiences in the region, travelling round, watching games, meeting supporters, players and coaches. Let's face it. South East Asia is seen as a market. A market for already rich European clubs to increase their shirt sales and social media followers. A market for tourists seeking the exotic picture postcard palm-fringed beaches. For me it was home. For nearly a quarter of a century. And following football there opened up a whole new world to this particular wizened expat. Go to a bookshop, seek out South East Asian books and what do you find? The usual travel guides, books showing you where to watch birds perhaps. Plenty of stuff about where to get the best spa or facial treatment. Books telling you how tough it is living in that part of the world. But South East Asia is also home to hundreds of millions of people whose stories remain mostly unknown to us beyond a media fuelled stereotype. Just like the UK is more than bowler hatted commuters and brawling football hooligans there is more to South East Asian than dodgy taxi drivers or scam artists and using football as a glue I try to present a different side to what is, for me, one of the most fascinating areas in the world. Meet little known clubs, local legends, world cup stars, football fans. Meet a passion and a desire for local football that is the equal of any in the world. These are heady times in Indonesian football what with match fixing allegations continuing to blight what remains of the game's image, a national general election on the horizon and some high profile figures stepping down from their high profile positions. In the wake of PSSI calling a number of social media accounts in for talks on match fixing allegations a police task force has raided their offices in search of information. Quite what these allegations say about so called professional bodies whose job, they claim, is to identify games which have been fixed by betting activity, is a moot point. Moot maybe but one worth bearing in mind as the Indonesian football association recently inked a wide ranging agreement with Spain's La Liga including how to clamp down on match fixers. Other such 'integrity' partners have arrived in a puff of acclaim only to disappear as they are replaced. Towards the end of January the PSSI chief Edy Rahmyadi stepped down saying he had failed in the position. The resignation surprised many, he had after claimed he wouldn't resign a month earlier, but delighted many more who had been less than impressed with his leadership which had seen him take time off to run in a gubernatorial election, slap a supporter on the terraces at a game, and rebuke a journalist for having the temerity to ask him a question. Now we have news Persija's main director Gede Widiade has resigned though not, he stresses, because of documents that may or may not have been incriminating which may ortugas kami sudah selasai' or basically our work is done! Yep, perfectly normal to quit the champions as they prepare for vital AFC Cup ties. Gede was previously involved with Bhayangkara, who were Liga 1 champions in 2017 and announced his arrival at Persija with the hashtag PersijaGW in a bid to appeal to the club supporters. GW, as well as being his initials, is short for Gue which roughly translates as I am. Quite where this leaves Persija is another question of course and of course there is no evidence either Edy or Gede have been involved in anything underhand and it is unlikely local media will dig to deep into latest events. All we can do is pull up a chair, crack open a beer or six and order a pizza. And remind ourselves the Liga 1 season won't actually start until May! I can only look enviously at Malaysia where today the Super League kicks off. You can't beat the feeling that comes on the eve of a new campaign where everyone starts level. From a footballing point of view let's hope that interest remains for the duration of the season and we are not left with another one horse race where other clubs are left staring at the heels of Johor Darul Ta'zim as they gallop towards another title. JDT are blowing every other club out of the water on the field and the onus has to be on other clubs to up their game or we could see the Super League turn into a farce. It is no good saying other countries are also dominated by one or two teams; other countries have far stronger footballing roots. What's the point of being the Galacticos in what is essentially a one team league? And what is the point of supporting another side when you know all you have to look forward to is a fight against relegation? Sadly two of the larger clubs in the country, Kelantan and Negeri Sembilan, were relegated at the end of last season while Felda United and MISC-MIFA, who get name-checked in my book Support Your Local League - A South East Asian Football Odyssey, fortunately now rebranded as Petaling Jaya City and, perhaps less fortunately, linked with the Manchester City group of clubs, have taken their places in the top flight. It could be interesting watching PJ City over the season. After just two seasons in the Premier League they earned promotion after runners up Felcra, another government department were disbanded despite finishing third. The idea of naming a football club after a district or a city isn't that common in Malaysian football and this attempt to tap into the large population of PJ could prove to be a smart move. Or they could find themselves coming up against more established clubs like Selangor and PKNS and find themselves out on a limb. They have kept K Devan as coach. The experienced for international has brought success to the likes of Selangor and Negeri Sembilan in the past but it remains to be see what kind of funds he will be allowed as he seeks to stablise PJ City in the top flight. Pahang are one team many have predicted to challenge JDT but have all too often fallen short with one second place and two third place finishes since 2014. For some reason they have never been able to maintain the consistency to overtake the rampant JDT. Forward Dickson Nwakaeme has returned to the club after time in France and his partnership with Norshahrul Idlan Talaha offers promise for the new season as does the recruitment of young Indonesian winger Saddil Ramdani. The presence of the versatile Singaporean Safuwan Baharudin also offers coach Dollah Salleh options either in the middle or at the back. Crikey, is Safuwan really 27?! It's always dangerous to predict good things for a football team based on their striking options but who can't fail to be impressed by the attacking options Kuala Lumpur coach Yusri Che Lah has at his fingertips. Brazilian Guilherme de Paula has averaged nearly a goal a game since arriving in the capital while the addition of Dutch striker Sylvano Comvalius, who struggled to make an impact with Suphanburi in Thailand after an explosive season with Bali United suggests an attacking approach from KL. It was undoubtedly goals which kept KL in the top flight last season; only champions JDT scored more. However they shipped 51 goals, conceding at least three goals in a game on 10 separate occasions. The KL faithful will no doubt be hoping the coach has been spending time on the defence ahead of the new season. Elsewhere supporters of Selangor, Kedah and Perak will be expecting their team to be there or there abouts but as with the rest of Malaysian club football do their owners share that vision? From a distance it appears not. In recent years some privately owned, and it must be said poorly branded, clubs have just given up, even when it comes to the second and third tier. Money issues or the futility of trying to compete with a club that has outgrown the league? For the good of Malaysian league football there needs to be a club to come along and challenge the hegemony of JDT.